President Jim McCluskey, along with the rest of the Club, would welcome new members who can add fresh insights and perspectives. It is true that the average age of the club, in common with most Rotary Clubs, is rising but new blood helps to reinvigorate us all. Age should not be a barrier to becoming a Rotarian it is whether the potential member is willing to commit to the cause. Recently we have been fortunate as our latest new members have been quite varied including ladies and gents, relatively young professionals from a range of walks of life and recently retired people, all willing to support the cause and "get mucked in". 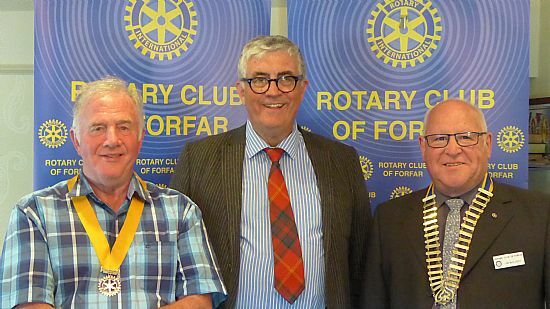 In many ways Rotary is at the heart of our Community here in Forfar and we certainly have Forfar and the folks we serve here in Angus and around the World in our hearts. Come and join us – you will be most welcome. If you want to find out more then why not fill in the Feedback Form and we will get in touch with details of how to join and enjoy being a Rotarian, its not only about meetings its being involved. There are over 32,000 Rotary clubs in more than 200 countries and geographical areas. Clubs are non political, non religious, and open to all cultures, races, and creeds. As signified by the motto Service Above Self, Rotary’s main objective is service — in the community, in the workplace, and throughout the world. Why should you Join ?? If you wish to assist those in the world with local to international needs, then you can make a difference if you belong to a worldwide organisation with, in many cases common goals. Help put back something to your community and beyond, it just needs for you to take that first step. Interested ??? then as suggested fill in your details in the feedback form and we will do the rest in informing you just what it is we do AND what you can do to make a difference. Put FUN into FUND RAISING and fill in the form now.